Seymour Charles Houghton married Mila Ann Chamberlain in Aug 19, 1870 at Enosburgh, Franklin Co., VT, USA, age 42. Cynthia Pease Houghton married Oliver Parmenter Titus in Jul 7, 1870 at Shelburne, Chittenden Co., VT, USA. Lucy Maria Houghton married Wallace William Hall in Dec 24, 1873 at Enosburgh, Franklin Co., VT, USA, age 25. 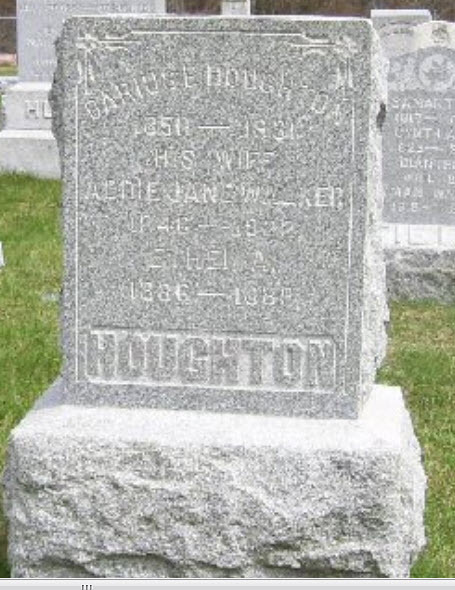 Darius Erastus Houghton married Addie Jane Walker in Mar 3, 1881 at Enosburgh, VT, USA, age 31; JWH gives date as his bd; JWH: Cambridge, VT.
Darius Erastus Houghton married Emma La Plant in Mar 19, 1924 at Enosburgh, VT, USA, age 74, 2nd mar. Charlotte Dunton married Joel Webster Houghton, son of Charles Houghton and Reliance Arvilla Webster, in Mar 3, 1867 at Enosburgh, Franklin Co., VT, USA. Mila Ann Chamberlain married Seymour Charles Houghton, son of Charles Houghton and Reliance Arvilla Webster, in Aug 19, 1870 at Enosburgh, Franklin Co., VT, USA, age 42. Oliver Parmenter Titus married Cynthia Pease Houghton, daughter of Charles Houghton and Reliance Arvilla Webster, in Jul 7, 1870 at Shelburne, Chittenden Co., VT, USA. 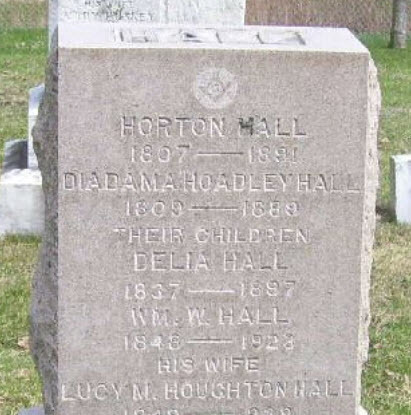 Wallace William Hall married Lucy Maria Houghton, daughter of Charles Houghton and Reliance Arvilla Webster, in Dec 24, 1873 at Enosburgh, Franklin Co., VT, USA, age 25. Addie Jane Walker married Darius Erastus Houghton, son of Charles Houghton and Reliance Arvilla Webster, in Mar 3, 1881 at Enosburgh, VT, USA, age 31; JWH gives date as his bd; JWH: Cambridge, VT.
Alvira Houghton married Amos Van Tassel in Jul 22, 1858. Alvira Houghton married Abner Abraham Van Tassel in Sep, 1867. David Chester Houghton married Lucy A. Welsh in 1865 mar 45 y in 1910 census. Aurilla Houghton married James Maxwell. Tamar Sophia Houghton married Jewett M. DeLong in Oct 30, 1872. Eliza M. Houghton married George W. Morgan in Jan 16, 1877. 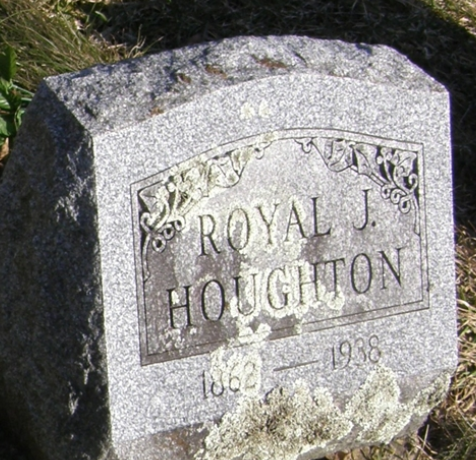 Royal J. Houghton married Edith M. (?) in circa 1885 age 22 and 18; mar 15 years in 1900 census; mar 22 y in 1910 census; Cady: 1885. 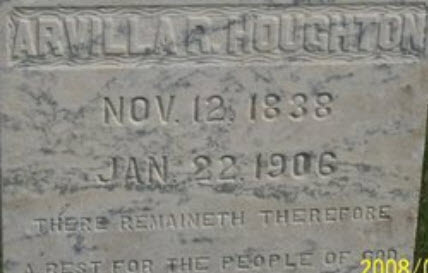 James Maxwell married Aurilla Houghton, daughter of Joshua F. Houghton and Cynthia Washburn. Jewett M. DeLong married Tamar Sophia Houghton, daughter of Joshua F. Houghton and Cynthia Washburn, in Oct 30, 1872. George W. Morgan married Eliza M. Houghton, daughter of Joshua F. Houghton and Cynthia Washburn, in Jan 16, 1877. George William Houghton married Hannah S. Day in Feb 2, 1864. Bvt Major Charles Henry Houghton married Lavina Anderson in Aug 18, 1863 at MI, USA. Helen M. Houghton married Robert D. Robinson in Jan 1, 1867. F, #9329, b. 3 February 1846, d. 30 October 1893? Hannah Ann Houghton married William Parlow in Nov 22, 1868. Death Feb 8, 1850 Macomb, St. Lawrence Co., NY, USA, age 6 mo.